The H.HAY? Guide To Lima, Peru - High. How Are You? 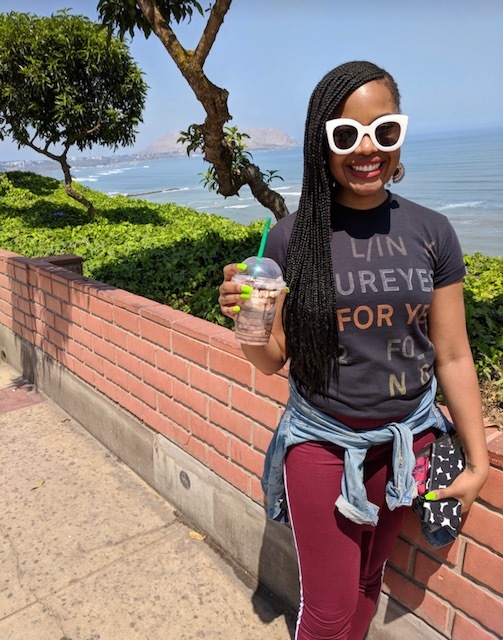 If you’re looking for a place to travel to that is affordable, gorgeous, and full of amazing places to eat, then look no further than Lima, Peru! 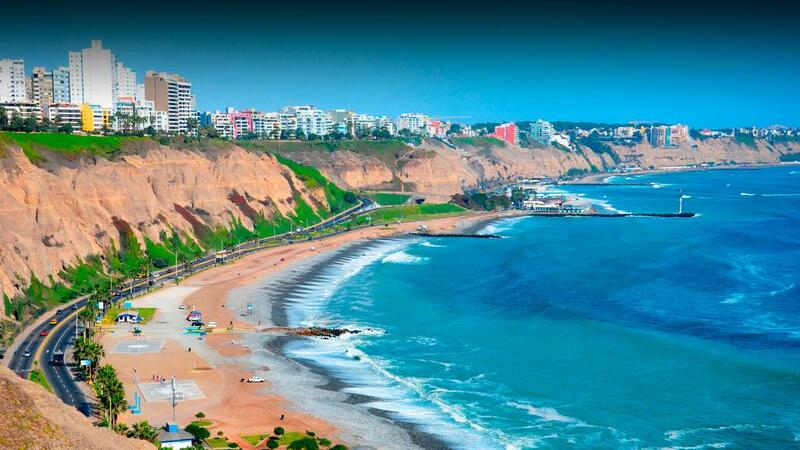 Lima, the capital of Peru, is located on the coastal side of the country and is the second most populous city in South America. It’s got a very laid back beach town vibe and the views of the Pacific Ocean are breathtaking. After my trip this past April, I decided to chose Lima as my first H.HAY? Travel Guide Pick. The following guide will tell you where to go, what to do, and of course where to eat! But first, let’s start with everything you should know before going. I don’t actually know if there are official traffic laws in Peru. It didn’t seem like there were. I mean there were traffic signs but they seemed more like suggestions to local drivers than an actual ‘on the books’ law. While in Lima, I took many Ubers (which were very cheap btw) and prayed the entire time that I would make it to my next destination unharmed. Just take extra caution while crossing the street and definitely wear a seatbelt! Judging by the random dank smells in almost every neighborhood I visited, yes. People in Lima smoke weed, however it is not legal in Peru. There is no where to buy it, but I was able to use the two grams I smuggled into the country with no issues. The general vibe I got during my stay in Lima was that people and law enforcement pretty much mind their own business unless they have to mind yours. So if you’re going to smoke, just be discreet. It is very helpful to know Spanish while visiting Peru. I wouldn’t exactly call it an English friendly place, although I was able to get by pretty well with my high school level Spanish. It did help to know how to ask for things. The people of Lima were very nice and understanding of my limited Spanish and were patient in trying to understand me. If your Spanish is that bad, I’d recommend taking a dictionary and using Duolingo before your trip. Go To Starbucks. Trust Me! Whenever I’m at Starbucks, I always order a mocha frappuccino with coconut milk. Of course I did the same when I stopped into Starbucks in Lima for a quick drink, only to find out that they took it up 3 notches. Ever since I’ve been back to the States, I have yet to find another mocha frappuccino that delicious. My husband said the same thing about his drink. There’s something about the Starbucks in Lima! I don’t know what that something is, but it’s worth checking out. Located along the Andes Mountains, parts of Peru can make you susceptible to altitude sickness. I highly recommend drinking coca tea. Coca tea is basically just coca tea leaves (yes, the same coca plant that cocaine comes from) steeped in hot water. Straight up chewing the leaves also combats sickness, but the tea happens to taste better. El Bodegon, located in the Miraflores neighborhood of Peru, was the first really good restaurant I visited upon arrival. Peru is best known for Ceviche, so prior to this restaurant I had tried a few places and their underwhelming Ceviche but wasn’t impressed until El Bodegon. This restaurant is also where I had my 1st Pisco Sour, the national drink of Peru made from Pisco wine. El Bodegon is a medium sized restaurant with huge portions. Almost every plate can be considered family style tapas. My favorite dish was the Pulpo (grilled octopus) and the Chicharron Fried Chicken! The brainchild of world renowned native Peruvian chef Gastón Acurio, Astrid y Gastón came in at number #33 on the list of The World’s 50 Best Restaurants. It was definitely one of the best restaurants I’ve ever been to. Although quite pricey, the tasting menu was a work of art full of the flavors and colors of traditional Peruvian food. Don Doh is an Osaka style Japanese steakhouse with a bit of Peruvian flavor. Not only was each dish amazing, but I was blown away by the cocktails. With it’s dimly lit atmosphere and wood grained interior, Don Doh was a romantic spot that was a nice shake up from all of the Peruvian food I had eaten up to that point. For a city with a million cevicherias, restaurants serving fresh seafood salad marinated in lemon juice, the best ceviche I had during my trip to Lima was from El Mercado. The menu is predominately seafood based and every dish was better than the next. El Mercado is led by one of Peru’s first celebrity chefs, Rafael Osterling, and what made it so special is the detail in each plate. The ceviche at El Mercado is a work of art. In addition to ceviche and pisco sours, Peru is also widely known for it’s production of chocolate. My first day in Lima I told myself to keep an eye out for Peruvian chocolate, and lo and behold there was a chocolate museum in the neighborhood I stayed in! It’s not really a museum per se, but more like a store with guides who explain the entire process of making chocolate from it’s original form of a cocao bean, to it’s many sweet variations. The museum sold chocolate liqueur, Chocolatey cocoa butter lotion, and even lip balm. Choco Museo also sold various ranges of Dark Chocolate, Milk Chocolate, and White Chocolate. Yum! Machu Picchu is a natural wonder located in the Andes mountains, three hours outside of Cusco. It contains ancient ruins from the Incan empire, built in 1450AD, over 7,000ft above sea level. Being that high up and being able to touch structures that belonged to ancient civilizations was extremely humbling. While I loved every second of it and strongly recommend that you visit, there are a few things you should know. To get there you have to fly to the town of Cusco from Lima, take a bus 2 hours to a town called Ollantaytambo. Then we took a train for an hour to a town called Aguas Calientes, which is where Machu Picchu is located. Once in Aguas Calientes, you have to buy a ticket to visit Machu Picchu. It is best to do the tour as early in the day as possible. Aguas Calientes gets its name because is is located on top of hot springs and they have a spot where you can actually take a dip inside a natural hot spring jacuzzi and have drinks brought to you. Paradise! Cusco is a city located an hour outside of Lima and the only way to get there is to take a short flight. In fact, in order to get to Macchu Picchu you have to fly to Cusco first but it’s a wonderful way to see what small-town life in Peru is like. There’s a huge town square where you can learn about the Cathedrals, European religious imperialism, and indigenous traditional clothing. 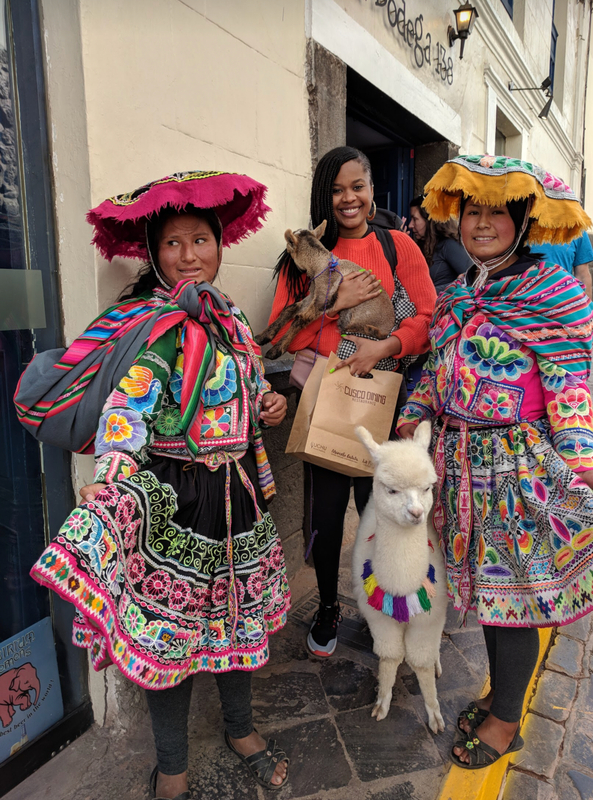 I met a few friends while I was there, including an Alpaca who was hell bent on eating my braids. Cala is a bar alongside the coast of Lima with breathtaking views of the Pacific Ocean and coastline. Visiting Cala was definitely my most glamorous moment of my trip. Cala had great appetizers and drinks and was a great place to watch the sun set over the coast of South America. While in Lima, I stayed in two AirBnb’s, in two different neighborhoods just to get a bit of variety. The first neighborhood I stayed in was in the trendy Miraflores district. Although centrally located and in close proximity to some of the best restaurants in the city, the streets were pretty quiet at night and the air smelled fresh and slightly spicy like just sliced peppers. There are a lot of beautiful houses in Miraflores so I highly recommend this neighborhood if you are looking for a safe, serene place to stay. Depending on where you stay it’s also a close walk to the beach. San Miguel is the second neighborhood I stayed in. Although it’s not as trendy as Miraflores, and there isn’t a lot to walk to, San Miguel is up and coming and lies directly along the coast line. I could hear waves crashing in the morning which was a great thing to wake up to. There was a lot of construction nearby which I could barely hear, but it lets me know that it is a neighborhood that is still in development. The price point and views make San Miguel worth checking out! That’s the High.HowAreYou? Guide To Lima! If you’ve been to Peru or are thinking about it, feel free to leave a comment below!